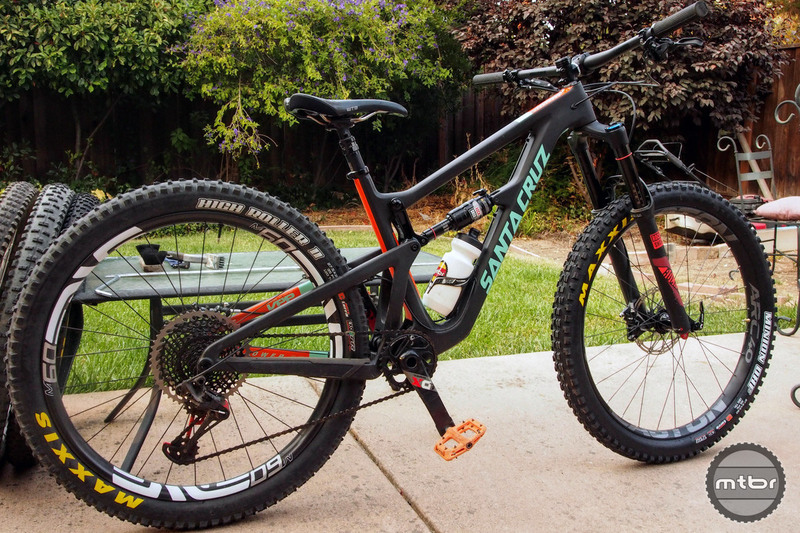 Our tester Santa Cruz Hightower looking good in plus and Eagle garb. At this point we’ve all grown a little tired of new mountain bike standards, but just like disc brakes and tubeless tires, if it proves its benefit the tribe embraces it. This is the key question we’ll attempt to answer in this review. Does SRAM Eagle 1×12 provide a significant riding benefit, what is it, who benefits? The other question is, how well is it engineered and manufactured to perform the task? Will it survive the demands of aggressive mountain biking? Read on for answers. Also be sure to check out our First Ride Review and get up to speed on all Eagle’s tech specs here. We’ve ridden the SRAM Eagle 1×12 on about five different bikes in all kinds of conditions over the last four months and the experience can be summarized in one word: Seamless. It just performs without calling attention to itself. The X01 group in all its glory. 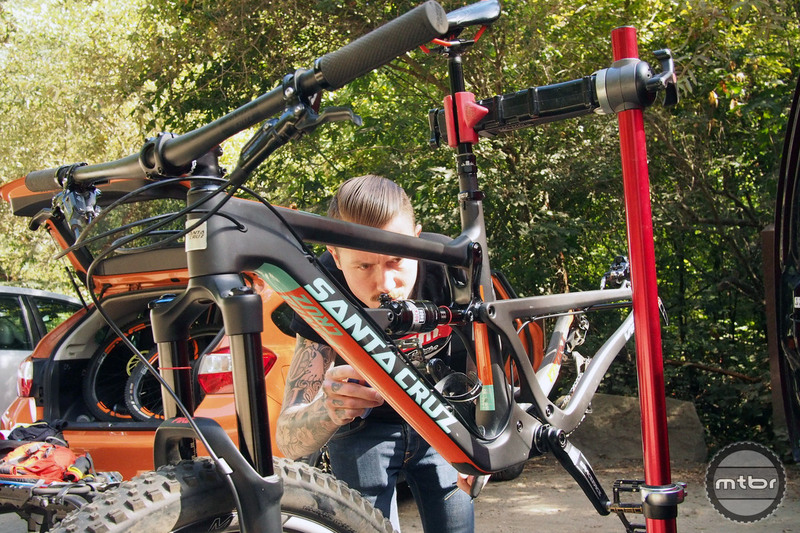 Ex-pro DH racer turned SRAM PR man, Duncan Riffle, paid us a visit in Santa Cruz to do the install of our test Eagle group. The shift quality rivals 1×11 or even 2×10. 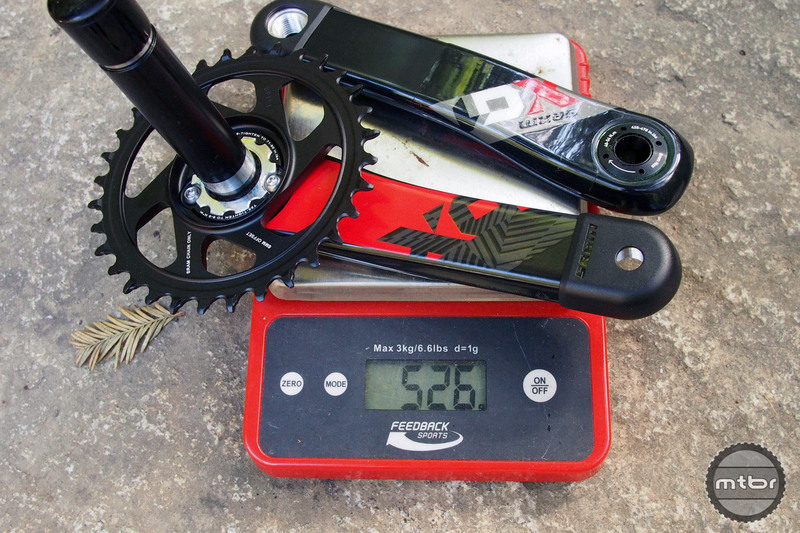 And in the Mtbr forums some have even said it’s better than their SRAM Red, or Dura Ace, or even Campy. It just works. 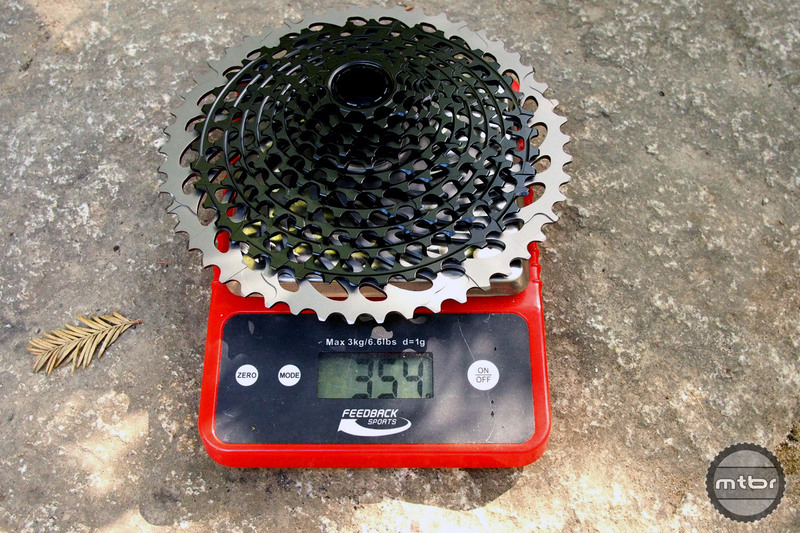 The SRAM X01 Eagle cassette weighs in at 354 grams. This is the common pre-ride complaint, as new users are concerned that their rear derailleur will get ripped out since one theorizes that the derailleur hangs lower. But SRAM has figured out how to tuck the derailleur tighter and they say the ground clearance is the same as with 1×11 systems. We certainly had no issues. SRAM X01 Eagle cranks come in at 526 grams with a 32t chainring. In our experience, there has been no issue with the derailleur getting caught at all. We’re sure it will happen to someone some time, but not at a frequency more common than on 1x bikes. The other factor to note is the derailleur is at its lowest point when it’s on the 50t cog. But that’s typically when speeds are low, as the bike is usually crawling up a hill. At ballistic speeds, the derailleur will be tucked in at a higher gear. That iPhone is a bargain compared to this cassette. And actually can be more useful. One can now buy decent bike for the price of a cassette (that’s gone after maximum of 2 seasons). It’s nice to have decent equipment but no bike is substitute for lack of common sense. Everything in moderation. So what’s next? It would seem the end of this non-innovation trend of adding a cog every once in a while has surely been reached with 1×12. Will the next big thing be affordable, electronically driven 2x drivetrains or internal gearboxes, or what? I have the XO1 Eagle installed on my bike. Here’s what I can tell you. It’s very simple. It gives me the range of my old 2X, and dramatically simplifies the whole experience. Innovation is no doubt expensive, and this will surely trickle down to the other SRAM levels and be way cheaper, and Shimano will come along…. Does it perform better than my 2X10 XT? Not appreciably, but it’s way simpler, essentially silent, and noticeably lighter. If i had the money, I’d put this on both my kids bikes as well. Reliable? Ask me in a year…. Hate on innovation all you want, but this is a game changer. Once 1X got the range of 2X, that’s the end of front derailleurs for me. Nice job SRAM, it’s amazing. On the whole I like the look of the Eagle group, but unfortunately I don’t have the chainstay clearance to run a large enough chainring to make it worth doing on my bike. Without adding at least 2-4 teeth up front I’d have no use for the 50t cog at all, and shimming the chainring outward to compensate and use a larger ring would cause really crappy chainlines in the granny gears. I think that’s the real limiting factor for most 1x drivetrains. It’s easy to get more granny gearing, but not so easy to get more top end without having to put up with bad chainlines. Having said that, my 1x with a 34t and 9-42 cassette gives me all the range I need AND good chainlines. I think one of the more crucial points that is missed in the article is on the engineering changes to improve longevity of the 1×12 Eagle components. Engagement of the chain on the chain ring is more secure and leads to less wear from what I’ve read before. Eagle components are engineered to last 2 to 3 times longer than comparable 1×11 and 1×10 components. That. I got the eagle on release day pretty much, so had it for some time now. It shifters better than my Red. It shift at least as good as Di2. No mishifts – ever. Not even the sign of one. It’s also very quiet. Does not seem to require adjustements. I wish my red was half of eagle at this point. Now is it worth the price tag? I don’t think so. regular X01 and XX1 are much cheaper and yes, a little bit less range – and yes, don’t shift as well and are noisier. But they’re pretty close. Does the E13 shift as smooth as the Eagle and does anyone pay full MSRP for the Eagle. Probably not and probably not. No one complains about the price of Next SL Gen 4 cranks, but they complain about how expensive Eagle is. If you go Next SL and pay less then MSRP for Eagle, it’s really not much more then other drive trains and shifts smoother then most, especially Shimano. I was shocked that SRAM came out with a cable actuated Eagle drivetrain. They have the electronic shifting dialed and ready for MTB… it had to be a marketing decision. The only reason to go to Eagle for me would’ve been to get a wireless derailleur. The e13 9-44 cassette is spectacular and it simply swaps onto your 11s 1x system today. I was skeptical on the 9T cog, but it works great. It was smooth. I like the bigger shifts… fewer shifts is simply a mental “shift” on what your cadence will change per shift. I now find the smaller shifts of a 2x system annoying. If you are used to a 32T 1x drivetrain, you can go to a 30T (elliptical) & either the 9-44 (4.9:1 range) or the 9-46 (5.1:1 range) without having to add 8 more links to your chain like the Eagle system does. I put the 30T & 9-44 cassette on my FatBike first due to deep & steep winter climbs here in the Rockies. The extra 14% climbing gear range (21% w/30T & 46T cassette) worked great while still adding 4% more speed on the high end. I really do not see the need for Eagle’s massive rear cassette. The e-13 9-44 weighs 232g for comparison, but you also can eliminate 8 links from Eagle’s chain… I now run the e-13 cassette on all of my bikes. I really hope we will get a wireless derailleur that “auto-tunes” your shifting (think bent hanger compensation) for 1×11… but I’m not holding my breath. SRAM will want to push everyone to the much more expensive 1×12 drivetrain. In regards to James’ comment about the dumbing down of gearing I have to admit that I run on both ends of the spectrum. I ride a lot of singlespeed but I also do a lot of bikepacking in the Alps which are horribly steep and have long, gravel or trail climbs. I’ve been running a 1X10 with a 42t big ring which hasn’t been nearly enough gearing for a lot of the climbs. So, the range on the Eagle system looks spot on. I agree though that in less steep mountains or short climbs there’s not a whole lot of need. Good thing there are lots of options for all of us. Having used a SRAM XX1 setup for over 2 years with a 34 at the front, I have rarely felt the need for a lower ratio but did miss having an acceptable top! I now also have a bike equipped with E Thirteen 11 speed, 9 – 44, cassette and a 36 at the front; much cheaper solution than Eagle, that works brilliantly with Shimano XTR and I have yet to spin-out! Wow. Just…wow. I am still trying to wrap my brain around the idea of having a 10 speed rear cassette, and now they are up to 12. I am interested to see how far this will go. And has anyone ever successfully engineered a CVT drivetrain for a mountain bike? If so, I’d love to see that in action. It’s not going to go further. 1×12 has the same range as a 3×9 or 2×10 system, so no need. Besides, space becomes an issue (I don’t think they can add more cogs really). The 1x train had to get to a point to match more traditional 3x and 2x systems. 1×10 and 1×11 didn’t cut it (although some butcher-job 1×11 systems comes closer with > 42t cogs swapped in). There have been several continuously variable bicycle transmissions developed and even marketed. Extra pounds is one issue, and sometimes smoothness is another. The big drawback is loss of efficiency (not an overall gain such as in car transmissions) that is readily apparent to any user. Eagle? They should have called it the Beagle! Because Beagles rule. So I should spend $1k for a 1×12 instead of an XT with a 46t for $350? Why? I have yet to find a climb that my 32×42 XT can’t handle (I live in the Rockies). Are we now just making expensive bike gear for overweight rich people? I spent most of the year with a Ethirteen 9-44 cassette, xtr 9000 derailleur and shifter and have to say that the ethirteen cassette has to be the most underrated cassette out there. I recently swapped the cassette with a SRAM XX1 to see if I can feel the difference. the shifting is a bit cleaner on the XX1 but without a doubt I miss the flexibility the ethirteen cassette offers, especially the 38 tooth gear which works perfect for all but the steepest rootiest (if that even a word) climbs. now that they have the 9 – 46 and just about the same weight as the XX1, I just can’t see why anyone would pay the price for the eagle. I love the fact that companies are pushing the limits and I hope they never stop. but in this case, I really don’t see any advantage buying an eagle drive train when compared the highest end 1×11 drive trains when paired with an thirteen cassette. I upgraded my 2×10 X9 to the X01 Eagle. First, the Eagle drive train does everything that they claim. Smooth fast shifts and never drop a chain. The problem for me is I miss being able to change gear ranges quickly. Get to the top of the hill and click click click click click. 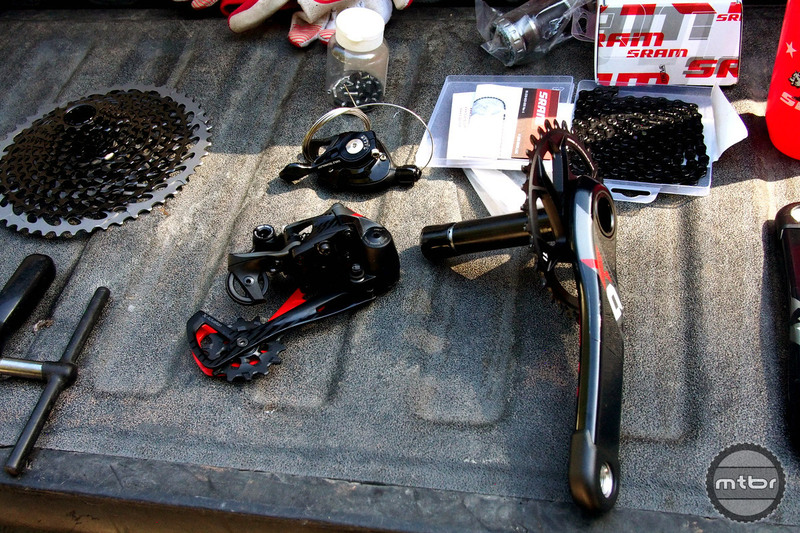 Sram really needs to be able to shift up more than one at a time.